Yesterday the Intel Extreme Masters Expo 2017 kicked off in Katowice, Poland, and T3 was in attendance reporting on a tech and games-packed first day. As one of the premiere eSports events in the world, one where the best players in a host of games compete to win a prize pool in-excess of $1,000,000 and a really big and shiny trophy, IEM not only delivers a genuine spectacle, with more than 11,000 fans packing the cavernous Spodek auditorium, but also an expo where anybody who is anybody in the tech and PC gaming fields is in attendance. And today, with the show seeing a series of dramatic matches taking place in the ultra-competitive Counter-Strike: Global Offensive tournament, as well as Intel, Oculus, HTC Vive, Virtuix and more showing off their latest and greatest VR technology and software, and various other key players demoing next-generation 3D printing, 360-degree photo booths, and ultra fast new computer hardware, among many other things, it has been even more intense. First off was the eSports highlight of the day, which saw the quarter finals of the Intel Extreme Masters 2017 Counter-Strike: Global Offensive competition duke it out inside the Spodek arena. 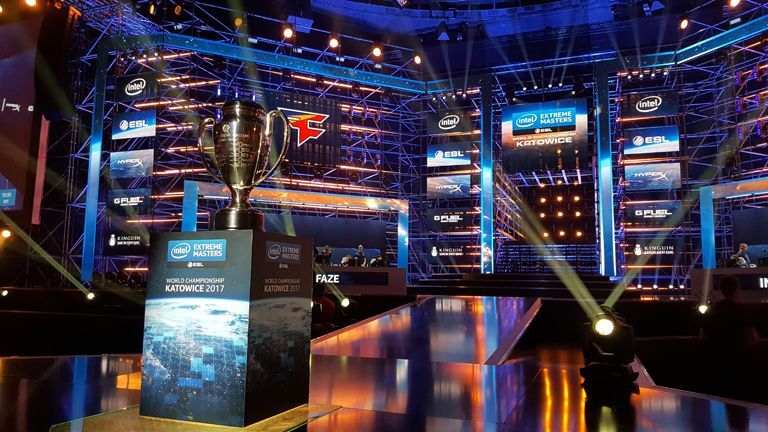 The auditorium was packed with near 11,000 enthusiasts and, after the mayor of Katowice himself brought in the huge IEM trophy, the matches began, with the show streaming out live all the way around the world. For those not familiar with these sorts of massive eSports competitions, the teams line up on stage to get introduced by the show's announcer and then, once the crowd has already gone wild, take their positions on two banks of pimped out gaming PCs on either side of the stage. All the while the show's live commentary team and pundits talk through the teams' past results, players, roster changes, and potential game plans for the upcoming match. And then the matches begin, with all the action taking place live on stage and relayed to the wider auditorium via a series of colossal display screens. The audio-visual spectacle is incredibly intense, with IMAX-levels of immersion thanks to the size of action and how loud it all is. The auditorium here in the Katowice Spodek is use to housing major international concerts, and the same sound system and lighting rigs are used to help deliver the action here. In the case of Counter-Strike: Global Offensive, that entails two teams of five players shooting it out across a series of game maps via heavily tactical combat. Massive money to play for and an even greater quantity of eSports fans to entertain, this central aspect to the IEM is serious business and helps complete the show's package of content, drawing together the show's PC tech-heavy expo, futuristic gadget demonstrations and retail opportunities. And, talking of cool new tech, one of the neatest things we saw today was over at Gillette's booth in the IEM expo hall. The razor-making giant is a sponsor of the Intel Extreme Masters and was using its presence here to demo some hot new 3D printing technology. At the booth Gillette offered attendees the opportunity to customize Gillette razor handles using 3D printing technology at its RZR MKR Design Studio. The array of customization possible was large, with shape, colour and weight alterable, and once a design was set it printed out right then in one of a series of 3D printers. The refinement and precision of the handle's build was a cut above other 3D printed builds we've seen, so hopefully Gillette will start offering the ability to design and receive a customized razor via its website in the near future, as right now customisation options are limited to modifying the handle of existing designs. While the custom, 3D printed razors were a cool find and definitely catching people's attention today on Day 2 of T3's IEM 2017 coverage, what was capturing even more people's imagination was the expo's numerous VR experiences, which varied dramatically. As we reported yesterday, Oculus and HTC Vive are major presences here in the Spodek, and their VR headsets and others are being used to great affect. From riding on mechanical apparatus that spins you round 360 degrees in VR, to in-car driving simulators, and windsurfing experiences where people have get on a real surfboard and traverse a VR watercourse, and onto a shooting game where players are suspended on a treadmill while wearing a headset and holding a replica gun, allowing them to move in the game and shoot by running in real life and aiming with the weapon, VR is not just been taken to a new level in terms of software, but is being freed from the constraints of being just a headset. This, in our eyes, is a necessary step in VR tech's future development, as while the largely stationary experiences offered by PS VR, Oculus Rift and HTC Vive are really cool, that ability to move and act freely in the real world while enjoying a virtual reality experience at the same time, will surely be the transition point where the technology transforms from useful tool or entertainment product to mind-blowingly immersive essential purchase. We're guessing after enjoying the VR experiences on offer here at IEM 2017, quite a lot of VR headsets are about to get shipped out. Right, that's it for today, however be sure to check back in soon for a T3-exclusive interview with Intel's Steve Shakespeare on the future of VR technology.